congo lesson #2: we need one another. you've heard the saying it takes a village to raise a child. well... it took a village to keep me stable & sane. we traveled to DR Congo with a beautiful group of people & left behind an amazingly, wonderful prayer support team. i am not sure where i would be without the emails & kind words we received from those back in the states... & i know i am a better person for knowing the beautiful people who experienced Congo with us. not even sure where to begin. none of us knew each other when we all met up in Brussels, but i can say i will never forget any of them. 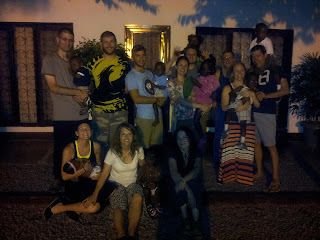 i seriously get teary when i think about all they did to encourage and support todd and i those 7 days in Congo. i cannot even begin to describe the level of comfort and love i felt from these 7 beautiful people. on the night of titus' first meltdown, todd & i sat on our bed, crying & ridden with so much fear. we cried and prayed. we wanted the enemy to be bound. we wanted change for the boys. we wanted comfort for the boys & for ourselves. at the same moment, we looked at each other and knew... in that moment... how thankful we were for the people that God had placed in our lives for the week in Africa. we began to pray and thank God for what they brought to our process. that they were willing to bear our burdens. to encourage us. to bless us. mama D... she was my rock there at sunny days. she reminded me that i was not alone. that i was strong. that we could do this... and if we couldn't, she was there for us. some of our conversations were so personal, i cannot share them, but in the end.... she showed me that she loved me, cared for my heart & my well-being, & was willing to help at any moment. one night, when i had hit an emotional wall, she walked down to talk about an update from our lawyer & knew i was at my end. the words she said to me were so encouraging to me. it was the perfect end to a hard night. Chris... oh how she encouraged me. she hugged my titus when he didn't want to love me. she tossed a ballon around. she brought a positive attitude. encouraging spirit. she gave me hope when i felt down. loved me when i was down. hugged me when i was down. and shared a beer with me when i needed a little relaxation. loved this girl. scotty... was an amazing encouragement. i am fairly sure that todd would not have gotten through the week without scott. he was a constant source of laughter for me. you have no idea how i needed to laugh. not sure where we would have been without the laughter & jokes & perfect words. adam said something to me that was probably the biggest reminder. he reminded me of what an amazing husband and father todd was & how because we had each other, we were going to be okay. we were going to make it. at then end of the week... it was exactly what i needed. to be reminded that, along with the strength that God gives us, we have each other and we will make it though together. and he was right... todd & i make a great team. corey... he was hilariously fun as well. he taught levi a hand shake (he still does it today), kicked the soccer ball around with titus when todd and i couldn't do it any longer (we kicked the ball around for HOURS a day) & he brought mashed potatoes (my favorite food) to our potluck. chasity... oh dear chasity. her encouragement over the week was unforgettable. and ever so needed. the Lord used her to simply encourage me through the week. she is by far one of the sweetest people i have ever met in my life. i feel like i have known her forever. each person had a "moment" that touched me. hers was a hug. simply hugging me, telling me she was praying; it touched my heart in the perfect time at the perfect moment. & of course there is paul. if you know me, or know my dad, you will completely understand this statement... but if you don't know me well, or don't know my dad, trust that there is no complement greater than this: paul reminded me SO much of my dad. here are the moments i remember so well. i had walked in on todd crying in the bathroom (something he had not wanted me to see). i couldn't handle it. i walked outside & looked at paul. leaned down and asked if he would go and pray for my husband. without a question, he grabbed me, prayed for me, & was off to our room. if that alone was it... that would have been enough. but that wasn't it. he hugged me. prayed for me. told me he was praying for me. let me cry on his shoulder. & told me i could do this. paul was chasity's pops. simply put, paul reminded me of the greatest man i have ever known. he reminded me of my dad. enough said. oh & lets not forget marcus & lindsay. oh they helped me in ways i never got to thank them for. they were adopting 2 little sweeties. two. just like us. in the thick of it. it was a reminder that it was hard. that i could get through it. that they while these sweet babies are hurting... we can give them the love that they need. when they need it. it might exhaust us, but we had it in us. that we were called to it. it was perfect. i am so thankful for them. for their youngest who cried like levi (it was a blessing trust me). an oldest who was strong & beautiful (like titus, but without the meltdowns). thank you both. you both are inspirational. our last moments together. i truly loves these beautiful people. thank you jesus for ALL of them. these beautiful people changed me. they gave me exactly what i needed that week. God gave me them, to give me exactly what we needed in this week. a week i LOVED. a week that i have CHERISHED since i experienced it. a week that CHANGED me forever. a week that BLESSED my socks off. a week that gave me two of the most beautifully, wonderful, crazy congo babies ever. a week that blessed me with two more sons. a week that showed me the need i have for others. and showed me different ways i NEED to be there for others. Hope all is going well as you bond together as a family.